Watching these busy little birds scurrying back and forth along the beach at Sker last Saturday was the highlight of my day. I had walked away a little from the group of birders I was with as I wanted to try to get better photographs of the waders moving along the water’s edge, and I’m so glad I did, as the birds weren’t as bothered about one person standing very still and silent as they would’ve been about 25 chattering people moving about, and so came up reasonably close to me. Small flocks of Sanderlings (Calidris alba), and other small waders, were flying back and forth from the rocks to the sandy beach to feed, poking their heads right up to their eyes in the soft sand to probe for their preferred food of small crustaceans and molluscs. According to the Merriam Webster dictionary, the name Sanderling is a combination of the fairly obvious ‘sand’ and ‘erling’, which probably comes from the Old English yrthling, meaning ploughman (from yrth earth and erian to plough). That certainly makes sense when you see these little birds in action. Sanderlings are passage migrants that move through Britain in spring and autumn on their way to and from their breeding grounds in the High Arctic and their over-wintering sites in southern Europe and Africa. The birds’ plumage changes for the breeding season, becoming much darker, with shades of reddish-brown on the head, neck and back, and you can still see hints of that on some of the birds in my photos. Also, many of my birds seem to be juveniles, with quite chequered markings on their backs and very clean white under-parts. One fascinating factoid I discovered when reading up about these birds is that they have only three toes on each foot, with no hind toe to provide balance, and this is the reason for their scurrying motion. 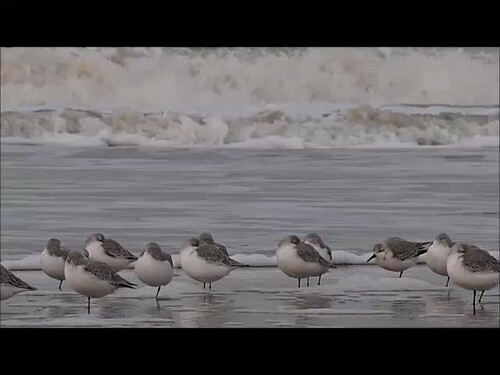 If you want to see Sanderlings in action, I uploaded a very short video to youtube. Oh, what sweet little things they are. So now I have learned two things today, that they have only three toes on each foot and that sometimes they use only one foot! Thank you both. What a busy beach! Great photos. I also really love! sanderlings! Great post!